Immediately after my Easter Manicure, I continued with the theme of Easter bringing new things and spring bringing flowers. I garden and have kind of been shocked with how early things started to come up here this year due to our unseasonably warm winter. Of course, flowers aren't safe with frosts coming still and we always seem to be guaranteed a snow in April (we did have freezing rain yesterday). But manicure flowers are always in bloom! I painted three coats of China Glaze Dance Baby. Using Bundle Monster Plate BM205, BM217 and Konad Image Disk m60 with Konad Special stamping polishes in Yellow, Apple Green, Coral Blue and Violet. Other colors used for the Hand Painting were China Glaze In The Limelight, Mistletoe Me!, and Full Spectrum. Libby is obsessed with these! I love them too. 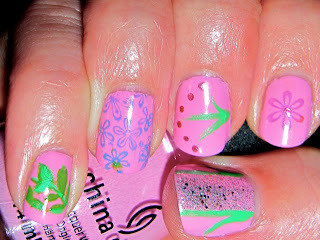 iLove to collect, polish and design my own nail art for my nails. For my enjoyment iCook, iWatch TV, iPerfect my laziness and iFind inspiration for my next manicure however it comes.